He’d been in our home for a week. We had a three-and-a-half year-old girl and an eighteen month-old boy when we added to our family through adoption. My husband’s orphaned cousin was almost seven when he came to live with us. Becoming the mom of a six-year-old was a steep learning curve, to say the least. I’m talking sink or swim. A week in, and he was bouncing a beach ball in the living room. I did a quick visual scan of the room and a quicker mental calculation, and wagered that the beach ball wasn’t a major source of concern. After all, there was really only one breakable thing within range: an ostrich egg lamp with Africa etched into the shell. My mom bought it for me when she visited Cape Town for my 21st birthday, and I loved it. It should be fine, I reasoned. Besides, even if it gets knocked, ostrich eggs are hardy. It’s a beach ball. The lamp’ll be fine. Large pieces of ostrich egg shell decorated the carpet. In that split second, the weight of my upcoming reaction flashed before me in full color. I was keenly aware that I had a choice, and my decision could have lasting implications. 2) Share my disappointment in a reasonable, gentle tone, then shake it off as “no big deal,” because it’s just a lamp. Besides, I hadn’t even told my son to stop bouncing the ball. This particular incident, when the beach ball met the ostrich lamp, was a keen teaching moment in our home. Whether I intended it or not, all three of my kids were learning by watching my reaction. I’m thankful to report that the Lord really helped in those moments, and enabled me to diminish my disappointment. He helped me show my kids that worldly possessions are only temporary. They’re not eternal. 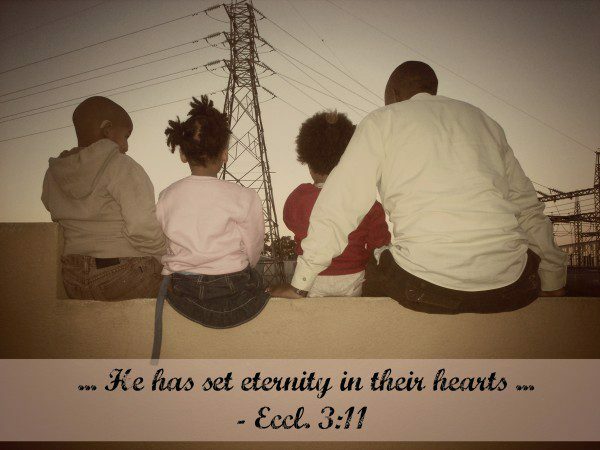 My kids’ souls, on the other hand, are eternal. It was our new son’s first week in our home, and he soaked everything up like a sponge. If I’d reacted in anger as soon as the lamp hit the floor, he would’ve soaked up the message that things are more important than people. He would’ve filed away the unspoken assumption that I loved the lamp more than I loved him. Looking back, I’m so grateful that God guided me through this pivotal parenting moment. Six years later, when similar situations rise to the surface, I still think back to that day and use the mental notes as a guideline. Obviously I don’t always get it right, but this memory often floats to the forefront of my mind and helps me keep my priorities straight. What memorable, teachable parenting moments have you experienced, and what did you learn from them? Thank you for sharing this beautiful story and the poignant and necessary reminder that our children’s hearts are more valuable than anything else. I always need these reminders, and it shows me (again and again) that parenting is so much more than the shaping of our children, it is the shaping of US, of ME. Parenting my kids is this unique window of time in my own life is God offering me transformation like a precious gift. Amen Sister…..I can never understand when people place “things” in front of others in order of importance. Things can be repaired and replaced much easier than a person’s broken heart. Hi there Kate. I’m one of your #TellHisStory neighbors. This is a beautiful story. How wonderful that God gave you self control, especially at such a crucial time. I’m reminded of the time a small visitor broke an enameled copper box, a box I loved seeing at my Grandmother’s house as a child, and that she gave to me later for my wedding 20 years ago. My heart about broke with the box, but somehow God enabled me to put it aside and remember the same lesson you’re sharing today. So important to keep our priorities straight! Gah, I know this well. These challenges came up often with my older children and my intent was to not allow my frustration to spill out in anger when I knew it was an accident. I remember getting ready to head out of town with the family and my nephew was with us. He thought his air soft gun was empty when he shot at the middle of our new flat screen TV. It wasn’t. Needless to say that big star imprint in the middle, which was seen during the height of stress for a mama, meant an immediate opportunity to catch myself with the inclination to scream. My lips were quite tightly pursed and it took me a few minutes to say anything, but phew. Far too many other incidents didn’t turn out so well. Thankful for God’s grace in parenting, but oh what an impact it makes when our children see material things valued less than them. Bless you Kate! This is a constant problem for me and I’m beginning to learn that my reaction is critical. It’s so easy to allow the hurt and frustration over loosing an object crush the spirits of my little ones. And I don’t want that…not at all. Thank you for the reminder that it’s always grace before anything else. I enjoyed your story! I’m so glad for you and your son that God gave your wisdom in the moment. What a sweet picture of grace, both in God’s work and yours. Blessings as you parent these three precious ones. This sounds like something I always tell my kiddos–“People are more important than things.” And God likes to put my own words to the test sometimes. It is easy to say that when they break something you don’t care about or isn’t yours! I pray I would believe the truths I teach my children as much as I want them to believe them! Truth! “He helped me show my kids that worldly possessions are only temporary. They’re not eternal.